OBIO IS ENGAGED IN THE DEVELOPMENT OF AN INTEGRATED HEALTH INNOVATION ECONOMY FOR ONTARIO AND CANADA, ESTABLISHING LEADERSHIP IN THE INTERNATIONAL MARKETPLACE. The Ontario Bioscience Innovation Organization (OBIO®) founded in 2009, is a not-for-profit, membership based organization engaged in strategy, programming, policy development and advocacy to further the commercialization of Ontario’s human health science companies positioning Ontario as a leader in the international marketplace. OBIO advances this goal through collaborative partnerships with industry, the investment community, academia, patients and government. OBIO’s 2019 report describes an early adopter model to facilitate the evaluation and adoption of innovative health technologies in Ontario health organizations. OBIO’s 2018 Industry Consultation reports five recommendations from health science company executives on how to create the conditions for the growth of Ontario’s health science industry. Bridging the Talent Gap reports on the unique value of OBIO’s Health to Business Bridge (H2BB) business internship program. This report describes how H2BB addresses the challenge of pulling top talent into Ontario’s health science industry to address the talent gap identified by 96% of Ontario’s health science company CEOs. The “Tackling the Anchor Company Challenge Summit”, assembled industry, academic, government and investment leaders committed to working together to create a mandate of action for anchoring health science companies in Ontario. The OBIO Capital Access Advisory Program operates downstream from existing entrepreneurship programs and targets the critical issue of access to capital at a post-seed stage of venture financing. OBIO CAAP strengthens Ontario’s cadre of investable human health science companies, increasing high value deal flow. How Do VCs Value Health Science Companies? On June 25th, OBIO participants had a unique opportunity to hear from experienced investors and analysts about how VCs think about valuation and how valuation is translated into deal structure. Participants also learned about commonly-used valuation methods, characteristics of equity and debenture instruments, calculating exit payouts, etc. On June 14th, OBIO hosted Dr. Yuan Fang (VP Regulatory Affairs, Quality and Manufacturing; Focal Healthcare Inc.) who spoke about his perspective on the recent changes at the U.S. Food and Drug Administration (FDA). Dr. Yuan spent over 8 years at the FDA Center for Devices and Radiological Health (CDRH), reaching the position of acting Branch Chief. During his talk, Dr. Yuan highlighted six important considerations when dealing with the FDA. 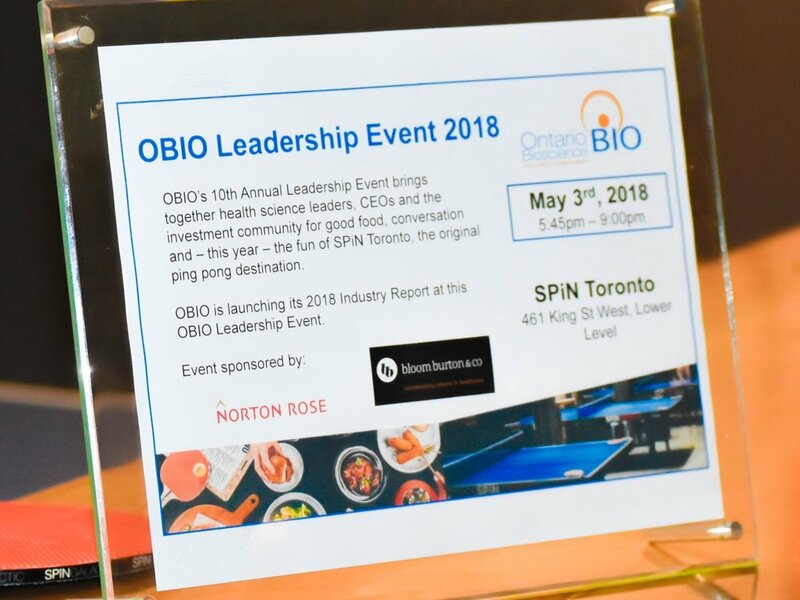 On May 3rd, OBIO welcomed health science leaders, CEOs and the investment community to the 10th annual OBIO Leadership Event. Hosted at SPiN, Toronto's ping pong social club, the Leadership Event also saw the launch of Use It or Lose It: Industry Solutions to Ontario's Commercialization Gap, OBIO's 2018 industry report. On February 1st and 2nd, OBIO - in partnership with Accel-Rx - hosted the Niagara Health Science Emerging Company Forum in beautiful Niagara-on-the-Lake. The event brought CEOs and senior executives from high potential Canadian health science companies together with senior leadership from American investors and strategics for two days of panel presentations, executive roundtables, networking dinners, and the opportunity to enjoy some of Canada’s finest wines. Pre-CAAP helps boost investability for early-stage health science companies at the seed or later stage who are developing health science services or products. Pre-CAAP companies get strategic business advice through one-on-one mentoring, subject matter specific workshops, and dedicated support and access to market research databases. They are groomed to be investor-ready through coaching and pitch review. H2BB is a collaborative initiative between academia and industry, aimed at improving access to talent across Ontario’s health science sector. Examples of what H2BB candidates can do includes conducting market research, business development, marketing and sales support, assisting with financial models, investor targeting and follow-up, and/or grant writing.